Visit Eqi-glacier. Calving every hour diretcly to the see. Glacier front +200 meter high and +4 kilometer wide. Hike to Icecap is possible from Glacier Lodge Eqi. (Guided hike sold separately). Visit a settlement where the everyday hustle and bustle is completely gone. Ilimanaq settlement is well run, with colorful houses scattered around the terrain and with a stunning view to the Disko Bay. The boat trip to Ilimanaq runs through the many grounded icebergs from Kangia ice fjord and maybe you're lucky enough to spot whales and seals before arriving to the village. From the seaside the colorful houses are very visible as well. We strongly recommend a village tour on your own or with a guide. If you like to hear stories about the harbor, school, church and shops, you should follow the guided tour. Departure time is announced in Ilimanaq Lodge reception and is included in the stay. The sled dogs are scattered around in their territory near their musher’s residence. In the summer time puppies run around freely and play. Please remember that the adult dogs are not pets and must not be touched. in Ilimanaq you will find one of Greenland's oldest houses, now turned into a restaurant. The restaurant has been lovingly restored in cooperation with RealDania. A buffet dinner of super fresh Greenlandic ingredients is served. Look forward to Greenland lamb, smoked reindeer and the musk ox, halibut and shrimps - Takana / Here you go! Enjoy the view of the stunning Disko Bay from your private terrace. All cabins are tastefully decorated and from the sleeping loft, living room as well as from the terrace, you have an incredible view of Disko Bay with its many icebergs. And who knows? Often the whales pass close by - so keep looking. Visit one of the older settlements in Greenland: The almost secret research area near Qajaa. The Qajaa midden is in the permafrost, and preservation conditions are unusually good and many remains testify to the Saqqaq culture, which lived here 4,000 years ago. 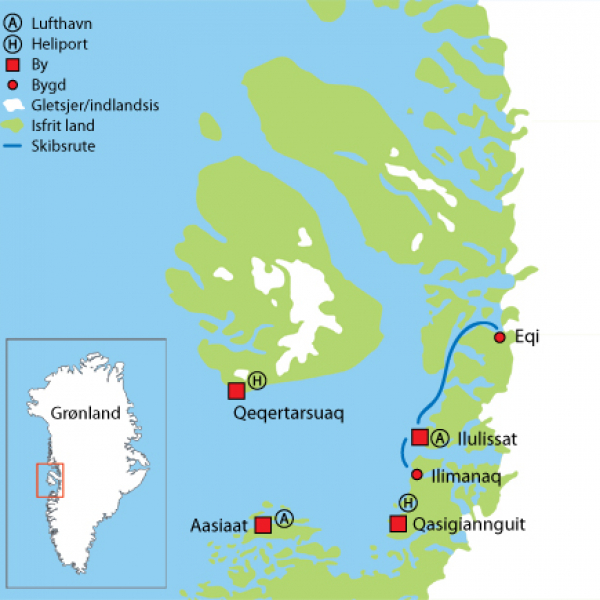 From Ilimanaq you have access to the Icefjord hinterland. The excursion to the ice cap is with ATVs and by boat. We go ashore at the southern bank of Tassiusaq fjord. From here we can hike to the ice edge and onto the ice between crevices and wells to explore one of the many glacier tongues emanating from the ice sheet. The sun reaches its highest point in the sky and shines all day on June 21. Several weeks before and after you can enjoy long light nights and a long day full of experiences in the area. 70 km in beeline north of Ilulissat, we find a true pearl. This is the area near the glacier Eqip Sermia, known as "Eqi". The glacier front is 3.4 km, and the average height from the sea bed to the top is approximately 200 metres of which 30 to 180 metres are above sea level. 08.45: We leave Ilulissat in a comfortable boat, with plenty of space inside as well as outside. Upon departure tea and coffee is available and some bread will be served. Beer and soft drinks can be purchased. During the boat trip the guide will inform about the sights we pass by. We will most likely see giant icebergs from the Kangia glacier as well as seals and whales. We pass by the village of Rodebay with its traditional colourful houses, and beautiful location next to the sea. 13.00: We arrive at Egi. At a safe distance we now enjoy the view of the 180 m. glacier front and lunch is served on board the boat (lunch incl.). For the next two hours, we witness big chunks of heavy ice breaking off the glacier and trembling intensely into the sea. 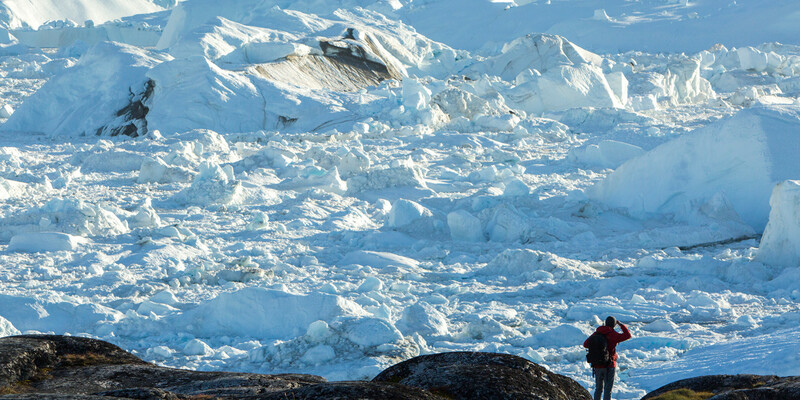 14.50: The boat calls at Port Victor at Ice Camp Eqi and we are only a short distance away from the glacier. Those who will be staying overnight now leave the boat and the rest stay on board. On shore the staff at Ice camp Eqi welcomes us and helps accommodate us in the huts. Upon this the guides will inform about the area and its historical importance and excursion options. Coffee/tea and cake is served during this. The rest of the day is at your own disposal. In the evening dinner is served at Café Victor. The stay at Eqi is full-board, drinks not included. On the departure day we offer a guided hike to the moraine (this hike is included in your overnight stay at Eqi). We leave Cafe Victor at 09.00. The trip takes us around the lagoon and close by the Egi glacier. From the edge of the moraine we will enjoy the view of the glacier and back at Glacier Lodge Eqi. We can just about see the lodge in the distance as a small dot in the wilderness. On days of departure from Glacier Lodge Eqi the boat leaves at 14.00. The boat returns, following the same course as on the way up, although the scenery seems quite different now. However, seals and whales are still a common sight. Coffee/tea and cake will be served (incl.) he boat returns to Ilulissat at 19.00 hours. Timeschedule can be changed, info will be given directly to all travellers. There is a wide range of different opportunities to do beautiful hiking trips in the area around Ice Camp Eqi. The ground is relatively easy with no risk of getting lost. The staff at Ice Camp Eqi will assist with suggestions to trips in the area. Depending on the level of your hiking experience you can do the hikes by yourself or alternatively buy a guided tour (easy to order at Eqi upon arrival). We set off from the huts and hike around the small lagoon situated south at the glacier. In the lagoon you can often see big flock of geese during breeding season. The trip to the edge of the beautiful moraine rewards you with a view of the 180 metres high glacier front at very close range while immense lumps of ice break off into the sea. The trip will take approximately 4 hours. The trip is long and varied and brings you through varied landscapes: lush lowlands, windswept highland, moraines and, not least, the ice cap with its canyons, rivers and glaciers. We follow the trail of Paul-Emile Victor leading into and up on the ice cap. In the period after the Second World War caterpillars supplying the famous ice cap expeditions of Paul-Emile Victor drove this way and today we see the remains of the machines and an old funicular. In the valley just before reaching the moraine we enjoy our lunch before setting off on the ice cap. The highlight of the day is the trek on the ice cap where we can see the spectacular phenomena of the ice sheet. After a long and hard day we return late in the afternoon and enjoy a well-deserved dinner. This hike will take you to the edge of the Delta with amazing views of the landscape. On the hike there and back you will also get spectacular views of the Eqi glacier. The hike takes you througt mountain terrain with relatively easy walking. It is possible to go on a guided trip.